It’s been a while since I traveled on Virgin America, so I was quite excited to find out what their airline food was like. Now, strictly speaking, it seems that US domestic flights don’t “do” food anymore. Instead, travelers are encouraged to buy small plastic-encased portions of food at inflated prices. I’m not complaining about this, as I’m hopeful it makes my air ticket cheaper, but there’s a certain part of me that’s nostalgic for the fancy aeroplane meals that come on trays. As a child, I recall looking at advertisements for Malaysian Airlines which showed beaming travelers tucking into lobsters, and though nobody has ever offered me anything other than “chicken or beef?”, I still cling to that hope. In the meantime, there’s something charming about doll-size portions of meat and vegetables, all neatly laid out on a sectioned tray. I also love the midnight service of cup ramen, which is the best part of an international flight to Asia. There’s a certain frisson to clutching a styrofoam cup of steaming MSG in a hushed and eerie darkness, dimly lit by the flickering images from other people’s movie screens. Unfortunately, there was no cup ramen on my cross-country flight and in the morning rush, I only managed to pack a few sad-looking ham sandwiches and some clementines. 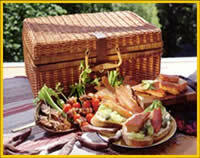 It’s too bad as I’ve always had secret visions of whipping out a luxurious picnic hamper, like the unfortunate prostitute in Guy De Maupassant’s story “Boule de Suif”, and nibbling on delicacies like duck confit nestled in a bed of fennel and apple salad on my tiny fold-out table. Or carving thin slivers of salami or Manchego cheese. Such daydreams are unlikely, however, since I didn’t even remember to pack napkins, let alone a gigantic basket stuffed with foie gras. Besides, nobody is allowed to carry pocket knives on board anymore. I was excited to discover, however, that you can now order food through your individual touch screen TV and pay for it by swiping your credit card. Giddy that humanity was finally moving towards Willy Wonka’s visionary TV chocolate, I studied the menu. Virgin America has clearly tried to position itself as a trend setter. The usual suspects of chips and nuts are redeployed under the guise of “Artisan Cheese Box” (cheese and crackers) and “Protein Meal” (nuts and energy bars). Not to be outdone, I pressed the button for “Non-GMO caramel popcorn sprinkled with sea salt” (100cal) and waited. It arrived in precisely in 3 minutes, brought by a passing stewardess. Later, I also ordered some dried fruit and nuts mashed together and Pringles. Each came in under 5 minutes, delivered in the same noiselessly unobtrusive manner. It was an odd experience, yet strangely addictive. 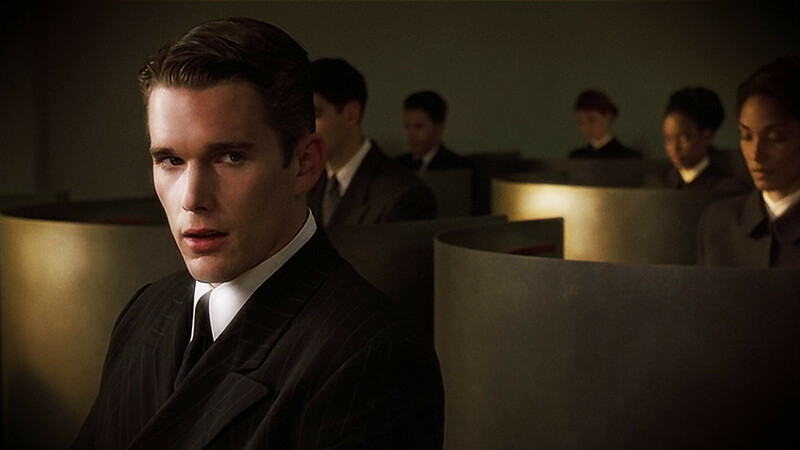 Looking around at my fellow travelers, all of us feverishly tapping away at screens and tablets, I was reminded of the sci-fi movie Gattaca, which offers an achingly well-designed future filled with silent hallways and people hurrying away on some kind of business. I don’t know whether the people behind Virgin are forging into this futuristic ideal, or whether they’ve drawn their inspiration directly from movies, but the result is a kind of self-fulfilling loop, where a picnic basket (a la Guy De Maupassant) probably doesn’t make carry-on size limits. What’s your favourite airline food? Haven’t tried either but am looking forward to it someday! I’m very disappointed to hear that a human delivered your non-GMO snack. Where’s the food delivery robot? Good point — I should have put that down on the “comments” form! love virgin air, love gattaca (used to show that in bio class…when i didn’t feel like teaching), love the idea of picnics. Hmmm, I definitely want to go to your bio class… Gattaca was a very good-looking movie and it’s aged well for sci-fi. I actually really look forward to those snack boxes on flights, in a way that is sort of shameful, really! Love that you got Pringles. Good call. There’s something really addictive about Pringles, even though technically speaking, they taste a bit like crispy cardboard. It must be the salt and crunch! I love traveling by train too, and wish there were more of them in the US. I remember taking the slow train from Malaysia down to Singapore many times before they improved the north-south highway. Trains deserve a whole blog post to themselves – thanks Ralph! On a flight from Frankfurt to SFO, the food was forgettable except for a delicious chocolate cake, which my neighbor on the flight left untouched during the meal. I am glad I did not ask him for it–he waited until coffee service and had it then. Why didn’t I think of that? Next time you’ll know to keep your cake for later 😉 I also like it when they give out small tubs of icecream! Flew on Lufthansa from Frankfurt-Boston once, they seemed to have had a couple meals short and some of us must have gotten meals from business class, as they were served on sumptuous-sized china dinnerware. As I enjoyed my vegetable ratatouille a la business, an old couple next to me started to argue over a pretzel (as in, the real German kind). She didn’t get one, he didn’t want his but she refused to take it. And yes, I’ve noticed that when the flight starts from Germany, they certainly nail the dessert right. So true with the ramen midnight snack – the MSG steam in the darkness certainly adds to the experience. I’ve actually learned to control and abstain myself from it, stomach grumble….